Frances Leap Hobdy died on December 23, 2018 at her home in Escondido, California. She was two months shy of her 99th birthday. Born in Fresno, California on March 1, 1920, Frances moved to Merced as a child and considered Merced to be her hometown. When she was 17 years old, she met Bob Rader on a blind date, and, as she often said, it was love at first sight. During the next three years while he was a cadet at the Military Academy at West Point, she and Bob wrote every day and managed two in-person visits. Earning $80 a month as a secretary, half of which she gave to help support her family, Fran saved enough money to buy a bus ticket to New York City the moment she turned 21. With $100 in her pocket she got a job at a bank on Wall Street and found herself a place to live (‘practically across the street from Bloomingdales’). Every other weekend for the next year and a half, she took the train to West Point. One hour after his graduation, on Jan 19, 1943, Fran and Bob were married. She moved 26 times in the next 24 years, raising her two children along the way. As an Army wife, she was active (usually as President) in various Officers’ Wives Clubs, volunteered with the American Red Cross, and became an expert at packing and unpacking and setting up a new home in a matter of days, complete with hand sewn curtains for every window. When Bob died suddenly at age 46, Fran struggled to find a way forward. She quit her job as a legal secretary in Hampton, Virginia and started college. Two years later she moved back to California to be near her sister. Even while pursuing other goals, she never stopped taking college courses, finally earning her BA at the age of 59. In 1972 she married her next-door neighbor, Bud Hobdy. They went into real estate together, joining the Escondido Board of Realtors in 1973. Fran was an associate and office manager at Denny Realty until it closed in 1975, and then an associate with Mark Realtors. She and Bud opened Hobdy Realty in 1978. When Bud died 8 years after they were married, Fran continued alone with Hobdy Realty. She helped design her dream home in Hidden Meadows that she and Bud had planned to build together and where she lived until her death. She served as Mediator, Vice President, and President of the Escondido Board of Realtors, as well as Chairperson of the Equal Opportunity and Budget Committees. In 1982-83 Fran served as Director of the California Association of Realtors. In 1986 she was named Escondido Realtor Broker of the year. She was an active supporter of the San Diego Zoological Society, served as President of the board of directors of Unity Church of Escondido, and was Director of Fowble and Associates, Architects of San Diego. When she was seventy-nine years old, Fran married once more. Although that marriage ended in divorce, she and Bill Lindsay remained friends until his death a few years later. Fran was extremely close to her 3 siblings, Ed, Mary Jo and Ken, all of whom predeceased her. She relished her role as grandmother. Her three grandchildren grew up on the East Coast but each spent many school vacations with her in Escondido, enjoying the fun and fresh perspective that a few weeks with Grandma afforded. 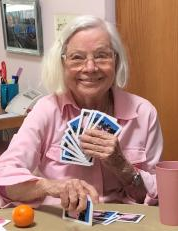 She was still playing bridge with her children and grandsons a few months before her death. Fran’s determination to soldier on despite grievous losses and to strive continuously to create meaning in her life remains an inspiration to her family. In response to her explicitly stated wishes, she will be interred with her first husband in Arlington National Cemetery. Fran is survived by her son and daughter, Bob and Judy, their spouses, Patt and Jay, former daughter-in-law, Ilze, her sister-in-law, Leola, three grandchildren, Jim, Dave, and Amy and their spouses, Van, Caroline, and Ken, six great grandchildren, Anna, Isabelle, Leah, Evan, Adalynn and Sydney, nephews, Jim and Jerry, nieces, Chris, Katy and Emily, and by her cherished second family, Bud Hobdy’s niece and great nieces, Anita, Anita Lee and April and their families.